alaTest ha raccolto ed analizzato 355 recensioni su Babyliss 7890U I-TRIM Stubble. La media della valutazione per questo prodotto è 4.5/5, confrontata con la media della valutazione di 4.3/5 per altri prodotti. Abbiamo analizzato differenti valutazioni di esperti ed utenti, età del prodotto ed altri elementi. A confronto con altri prodotti, Babyliss 7890U I-TRIM Stubble ha ottenuto un alaScore™ complessivo di 86/100 = qualità Molto buono. This replaced an identical model, the (non-replaceable) battery having failed after several years of use. I have been very satisfied with the original and with this replacement. Have previously used a Remington beard trimmer which has proved excellent. 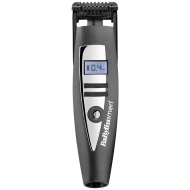 However I wanted a trimmer more suited to a short beard or stubble. the BaByliss 7895U I-Stubble has proved to be just the job. Bought this for my husband. He is pleased with the product and felt it represented good value for money. Great product bought the same one as few years back and have purchased the same one again. Easy to use. Long lasting. Quality matches the price. excellent buy husband loves it.. Exceptional quality product , best feature for me being the memory setting of the last cut .